""With contributions and additional material from Raymond Buckland, Raven Grimassi, Patricia Telesco, Morning Glory Zell-Ravenheart, and other illustrious members of The Grey Council, here is the book Merlin would have given a young Arthur...if only it had existed. This essential handbook contains everything an aspiring Wizard needs to know. It is profusely illustrated with original art by Oberon and friends, as well as many woodcuts from medieval and alchemical manuscripts�plus charts, tables, and diagrams. It also contains: Biographies of famous Wizards in history and legend; Descriptions of magickal tools and regalia (with full instructions for making them); spells and workings for a better life; rites and rituals for special occasions; a bestiary of mythical creatures; systems of divination; the Laws of Magick; myths and stories of gods and heroes; lore and legends of the stars and constellations; instructions for performing amazing illusions, special effects,! and many other wonders of the magickal multiverse. To those who study the occult, in particular, Witchcraft, the name of Oberon Zell-Ravenheart is internationally-known and respected. He is a genuine Wizard, and he has written this book for any person wishing to become one. Perhaps, as some have written, Oberon Zell-Ravenheart is the real Albus Dumbledore to aspiring Harry Potters! In addition to his own writings in this collection, he also presents other writers who add some highly thoughtful insights. Such as Raymond Buckland among others. The illustrations and photographs which accompany the text are among the finest found anywhere, and are a helpful boon to those wanting to see what they are reading about. Biographies of many famous Wizards of history and legend appear in the book. Detailed descriptions of magickal tools with information for making them appears in this book. Additional information includes rites and rituals for special occasions, a bestiary of mythical creatures, a detailed and educational discussion on the laws of magick, myths, and lore of the stars and constellations. This book is full of instructions! As a handbook and guide for becoming a Wizard, this is as near perfect and honest a book as one will find today. New Page Books has done a great service to the paranormal and occult community readers by publishing this worthwhile reference book. Oberon Zell-Ravenheart has written a classic on Wizardry. This is his masterpiece. One of the American pioneers of Paganism in the United States, his lifetime of learning and information is shared with readers from all walks of life. He started in 1968 with the publication of his award-winning journal, Green Egg, and is often considered by readers as one of their favorite Pagan writers. The lessons in this fine book are accurate, honest, and entertaining. If you want to become a Wizard, this is the book to start with, and learn from. 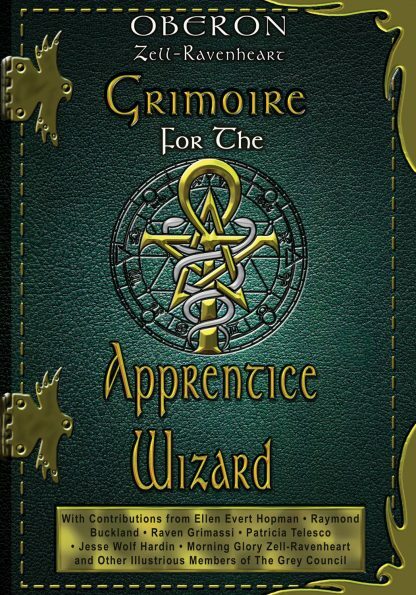 This Grimoire is must-have reading for readers interested in true magick. The information given on ghosts will hold the reader spellbound, as will all information in this reference book! Oberon Zell-Ravenheart is an elder in the worldwide magickal community. Through his publication of Green Egg magazine over a period of 30 years, he was instrumental in the founding of the modern Pagan movement, which he so named. He is author of the acclaimed Grimoire for the Apprentice Wizard and Headmaster of the online Grey School of Wizardry (www.greyschool.com).